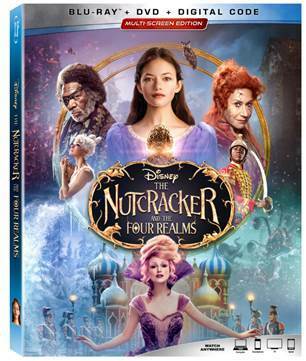 In “The Nutcracker and the Four Realms,” Fourteen year old Clara travels along a golden thread, presented at Drosselmeyer’s (Morgan Freeman) annual party, eagerly searching for a one-of-a-kind key that will unlock a music box that holds a priceless gift. When she enters a mysterious parallel world, Clara encounters a Nutcracker soldier named Phillip (Jayden Fowora-Knight), a gang of mice and three Realm regents, including the Sugar Plum Fairy (Keira Knightley). Ultimately, she must brave the ominous Fourth Realm, home to the tyrant Mother Ginger (Helen Mirren), to retrieve the key and return harmony to the unstable world. I was very excited to watch this movie with my family because I have always loved the nutcracker story and I was hoping my kids would feel the same. My 3 daughters along with my niece watched this movie and they really enjoyed it overall. The costumes and scenes are gorgeous and magnificent to look at and the stars that appear in the film were a bonus as they made the film more enjoyable to watch! I did find myself a bit disappointed as I was expecting there to be more dancing /ballet in the movie however it was a different approach to the original storyline and I can see how someone who may not appreciate the ballet enjoying this film more! My 9 year old niece enjoyed this movie the most as she loved Mackenzie Foy as Clara. She loved the ending of the movie when the sugar plum fairy is defeated and Clara then returns to dance with her father. Overall, the four kids that watched this movie with myself really enjoyed it and all agreed that they would watch it again. I did not enjoy it as much and found that I had greater expectations of the film prior to viewing it.